Hidalgo Moya was an American-Spanish engineer who lived in England. After first building the Moya typewriter, he set up the Imperial Typewriter Company to launch this interesting down strike design. The machine was first marketed in 1911. The model B was introduced in 1915. 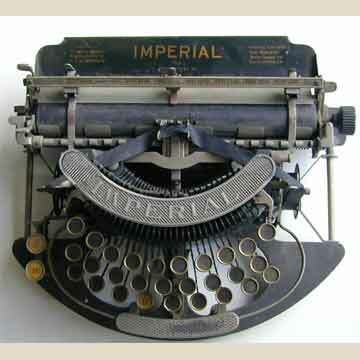 The most striking aspect of the Imperial is the curved keyboard. On the Model B the entire keyboard and type basket could be lifted off the machine and replaced. (See Imperial B). When compared to the Imperial B the A was a far more basic design. The base of the frame had sharp edges, there was only one shift key on the left, there was no backspace lever and there was no protective cover over the ends of the key levers. Still, the design was quite successful, with more than 8,000 machines built and sold. The great breakthrough for the Imperial Typewriter company however, came with the introduction of the Imperial B in 1915. For a detailed history see the book TYPEWRITER, page 190.